Suzanne is an Arizona native who grew up in Mesa and her passion for nonprofits grew out of volunteering as a youth. Suzanne graduated from ASU in 2002 in Recreation Management with the particular emphasis and certification in nonprofit management from the American Humanics/Nonprofit Leadership Alliance. 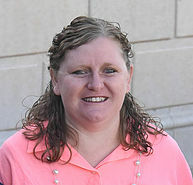 In 2002, Suzanne began an internship at Arizona Literacy & Learning Center (ALLC) and during the 15 years at ALLC, she held a variety of leadership roles in which she gained valued nonprofit management skills in operations, grant writing, fundraising, program evaluation, data collection and much more. Suzanne is excited about the results Read Better Be Better is achieving with students throughout the community and is pleased to be involved with an organization that feeds her passion to help kids master critical reading skills. Suzanne’s passion to ensure Arizona children acquire the reading skills they need to become successful learners and find joy in reading is derived from her own personal struggles with reading as a young child and close family members who have struggled with dyslexia. Suzanne lives in Mesa, Arizona with her husband Charles and son Ryan and a tortoise named Master Luke. Her hobbies include; photography, glass etching, and remodeling projects in her home.